"WonderElla™ is a wonder-filled memory game of Sets & Match with Math, Colors, and Animals. 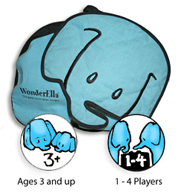 WonderElla comes in an adorable cotton bag containing 18 jumbo-sized, game pieces depicting Ella and nine of her animal friends. 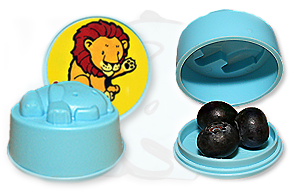 The WonderElla game pieces can be filled with surprise hidden treats for added fun and excitement!" China Potential choking hazard can exist from small items used as surprises inside game pieces. Before you buy a product, it's generally common practice to be familiar with what it does, the branding, and other details.� We feel that the same rule applies to our "New Inductees" we announce each week, so this section is titled "About Our New Inductee." The information in this section will provide you with a quick yet accurate glance of what the product or service is all about. The co-creators of WonderChess� and Cranium� Cadoo� have brought you a new game which contains an outrageously huge level of FunFactor� titled, "WonderElla�".� WonderElla� is just as they claim, the game you'll never forget! Best of all, WonderElla� is designed especially for kids yet even parents will find it literally irressistable to play. There have been plenty of memory games around but WonderElla takes memory games one step further!� The game has 18 jumbo-sized, game pieces, each depicting Ella and nine of her animal friends. The more unique angle of the WonderElla game pieces is that they can each be filled with hidden treats just waiting to be discovered! While it's great for some people who just want a cursory glance at what a New Inductee is all about, there are many others who have a greater appetite for more information.� This section is titled "Additional Details & Perspectives".� and will provide you with additional details and perspectives associated with the product or service being featured here. It is of the highest importance to remember that a child's memory is a vital building block important in the development of relational cognizance, establishing selective patterns of recognition for people and events. A child's memory is essential for transforming information into knowledge that facilitates problem solving at a later time or age in their life. WonderElla is a game which assists in the creation of this vital building block via matching characters, shapes, colors, sounds and more. Through repetitive Play, it serves as a vital component in memory improvement with a long term benefit in a child's developmental skills. WonderElla is even more unique with the fact of it's application for individual self-play or group play, portability, developmental skills, and contribution to eco-Concious efforts.�The cotton fabric bag which holds the playing pieces�allows you to just drop it in the washing machine�when soiled.� For many mothers who had the opportunity to play the game during our evaluation process, this was an important feature. The game play itself�is another invaluable feature if WonderElla.� One of our independent evaluators encapsulated the foundation for that statement so perfectly; WonderElla is a product which equates to having a virtually unlimited number of methods with which to use it in educational or personal play. "� Essentially, you are not tied to a limited number of ways to play game.� As the evaluator�goes on to say, "The limits of application for personal or educational use are set only by the creative imagination of the person creating the plot�of how the game will be played." "The 'unique play' of WonderElla will encourage the development of perceptual / motor skills, and scientific / mathematical thinking and awareness. This is a product that proves 'different' can be recognized as beneficial. WonderElla is a product which equates to having a virtually unlimited number of methods with which to use it in educational or personal play." "So elementary in design, yet so effective in the quickening of active thought processing and executive cognitive functioning development. This in itself summarizes the significant contribution for the betterment of a child from active play with WonderElla." "For the pre-school age child, WonderElla represents an incomparable blending of the foundational elements of learning and fun. It also serves as a radical stimulant for the development of cognitive skills." PLEASE NOTE: At the request of our independent evaluators their names are not disclosed to protect their personal and professional privacy. Their labors are provided at no charge to assist us in providing a well-balanced and accurate product or service evaluation summary. Their title is provided to clarify for our readers the specific type of specialist from which each of the report excerpts have been authored. 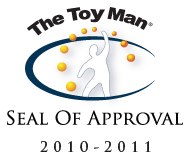 All opinions and or statements from the independent evaluator(s) featured here do not represent the opinion of The Toy Man� Product Guide, any member or division of GreyWolf Corp, or GreyWolf Corp itself. The Ventura County Fair 2010 was our hands-on consumer evaluation location this time. Plenty of people and products made this evaluation quite enjoyable. Considering the livestock area had loads of kids feeding the livestock and WonderElla having animals under each of the game pieces, what a better place to have consumer hands-on evaluation. The children were fascinated with the challenge of trying to remember and match each of the game pieces. Whether making matches from sound as they shook each playing piece, color, shape, or character, there was never a moment when kids were not engaged in playing with WonderElla. Their favorite part was when they had a match and discovered what surprise was inside! In conclusion of the spontaneous consumer hands-on evaluation of the products they examined, we sat down and went through the video-tapes and consumer feedback forms to establish where Wonderella stood with the consusmers. The end result was a shining approval with a large number of compliments by many of the mothers about the portability convenience, color of the packaging, and responses from their children. WonderElla passed this segment of our evaluation and with no complaints. The Featured Category Ratings Sampling For This Evaluation Summary Are Listed Below. DURABILITY was by far the strongest rating out of the entire lot of evaluation categories from which these 6 were selected. We pushed the puzzle pieces to the limits with the help of a plastics engineer who is one of our independent evaluators. The results proved that the playing pieces are made of a plastic compound that is extremely durable yet with enough flex so that if one of them is broken, it will not break into harmful shards. WonderElla has met the tough demands expected to pass in this evaluation category and earn a score of  stars for DURABILITY. FUNFACTOR was probably the easiest of all of our evaluation categories to establish a solid and unquestionable rating. From the very start of our working with the families as well as our ow in-house labors, you start with a few smiles but within a matter of minutes your are experiencing plenty of laughter. WonderElla has an interesting way of stirring emotions which in turn incites an accelerated level of skill development from repetitive play. Although the level of FunFactor�	was so very strong, there is still a level of creative strategy that is needed to win the game. This subdues the FunFactor�	from emerging to its fullest degree. WonderElla completes this evaluation category with an outstanding, almost perfect score of [4.5] stars in this category for FUNFACTOR�. Establishing an accurate and fair rating for the LEARNING CURVE with WonderElla was a short and simple task. With every single child or adult who sat down to play with WonderElla, they were already into Play within 5 minutes or less on the average. No matter which of the styles of playing the game were being used, the learning curve was practically non-existent. The design of the game is such that not only is the learning mastered in such a short period, the development of skills from playing the game is drastically accelerated. WonderElla comes through the gates in this evaluation category for LEARNING CURVE with a rating score of  Stars. Establishing an accurate and fair rating for the evaluation category of MARKETABILITY proved to be a challenging task. WonderElla is a rather unique new game based upon an age-old game concept. After careful and extensive review of all category rating scores, video recordings, and consumer feedback forms, it was determined that WonderElla possesses the right elements to draw the attention of children to play repetitively. Even parents are drawn into playing one of the many variations of playing the game. Add to that the factor of strong levels in the skill development arena, WonderElla came to the front with a rating score of [4.5] Stars in this category for MARKETABILITY. SKILL DEVELOPMENT: Rating Level - [4.5] WonderElla was literally screaming how it contributes substantially to skill development. In a quote from one of our independent evaluators, "So elementary in design, yet so effective in the quickening of active thought processing and executive cognitive functioning development. This in itself summarizes the significant contribution for the betterment of a child from active play with WonderElla." 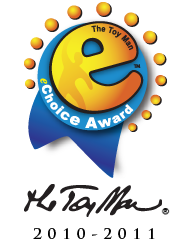 WonderElla encourages and contributes to a child's skill development more than sufficiently enough to pass in this evaluation category, pulling a final score of [4.5] Stars in this evaluation category for SKILL DEVELOPMENT. When it comes to VISUAL APPEAL, WonderElla pulled its way past an average rating score and almost to an above-average rating in this evaluation category. We found that the women who participated in our hands-on evaluation were quite fond of the cotton fabric bag which is shaped to resemble and elephant and holds all 18 playing pieces. In the overall feedback covering both the bag and the playing pieces, everything was referenced as being "cute" or other terms that were similar in definition. Although WonderElla was seen as being so "cute" there just wasn't enough WOWfactor� to pull a higher rating in our evaluation. WonderElla passed this evaluation category with a score of [3.5] Stars in this category for VISUAL APPEAL.